By Sheila - Australia - 18 Sep/03 - Viewed 2729 times. Driving into Brisbane on the motorway was a bit of a shock after spending 5 days in peace and tranquility. The pacific highway north of Sydney is for the most part a pleasant single lane road with regular overtaking lanes and little traffic until it becomes motorway just south of Brisbane. Our hotel should have been 2 easy left turns, but having missed the second one we got lost in the one way system. Sod's law says when you stop to ask the way you are usually standing right outside your destination. In our case we were just around the corner but you could see the flags of the hotel flying above the buildings. By this time i was feeling hot and a little grumpy and wishing we hadn't booked 4 nights in the city. However, after cooling off in our air conditioned room and discovering that i could dial the internet for A$0.75 a time from the room (+ isp charges), and having successfully acquired a local 'pay as you go' ISP i was feeling much better. The isp is http://www.bigpond.com who charge A$3.95 per hour but were in fact doing a months free trial so it shouldn't cost me anything. When the day had cooled we took our courage in both hands and attempted to drive to the South Bank Parklands where according to the free hotel map there were several restaurants. First time round we got it wrong and ended up back at the hotel 10 minutes later but at least we now knew the best way in. Second time the sun had gone down a bit and was no longer blinding us to the signs ( that's our excuse anyway ) and we found it was actually quite easy. The South Bank Parklands is an area along the river bank with a lovely bougainvillea archway along its length, an imitation beach and pool and the promised restaurants and cafes. A very romantic evening setting. The next day we decided that as Australia zoo was near the Glass House Mountains it might be a cooler alternative to the city. Unfortunately we were wrong but we managed to spend a fairly pleasant few hours hurrying from shade to shade. The following day we did a trial run to the airport, which we completed without mishap. It is about 20 minutes from the city centre. We then managed to find our way to a deserted beach full of warm shallow pools at low tide and spent a pleasant hour splashing about in them. 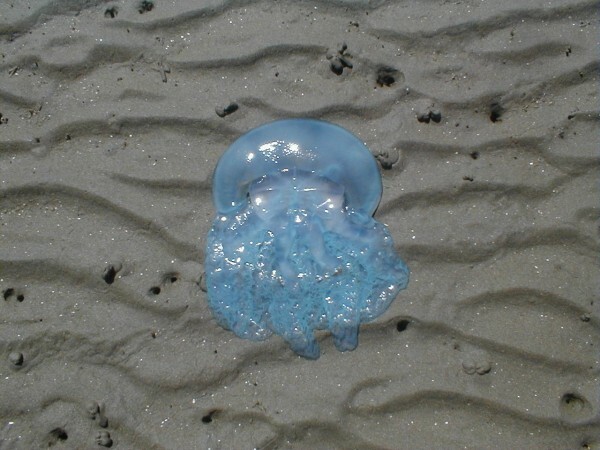 We found an almost perfect blue jelly fish which must have been only recently washed up on the beach. After a picnic lunch we drove further north along the coast to Shorncliffe and strolled along the pier where we saw several live blue jelly fish swimming at the end. We were amused to see several ELECTRIC barbeques installed along the beach and being Sunday every one was in use. Almost everywhere we went there was some type of BBQ. For the last day we decided to go to Mount Coot-tah. This is a small hill/mountain about 6k from the city. Here you can find the Royal Botanical Gardens, a Planetarium - a forest, a lookout and...... lots of BBQs! The gardens were very good and had a lot more interesting plants than the ones in Sydney but no bats! Before we knew it we had spent 2 hours wandering and still hadn't seen it all. It is also used as a wedding venue and we saw a kilted bag-piper playing in the grounds while the guests arrived.....but we missed the bride. We decided to skip the Planetarium but went for the lookout which gave stunning views of the whole city and beyond. We also followed some signs to the JC Slaughter Falls thinking that it meant waterfalls but after a pleasant shady stroll that turned into a hot climb decided that if there had ever been waterfalls they had since dried up. When we checked out of the hotel there were a lot more internet call charges than i had actually made - apparently the computer system that records them is unreliable! but they removed the excess charges without proof.